I have promised to share how I have been styling my house, or at least parts of my house, as I get it ready to sell. The first room that I have been focusing on is the master bedroom. It is a long, thin room. The bed takes up one end, with the bedside drawers on either side. The bed sits in front of the largest window. Other than dressing the bed, there really is not a lot I can do about it. I am looking forward to my new house – I will be getting a new bed, and hopefully will be able to do a lot more! At the other end of the room there is plenty of space for… something. I could have put the tall boy there, but then what? It would have been just a boring room! But by putting the tall boy next to the door, I was able to create a refuge, a retreat. I love my retreat. 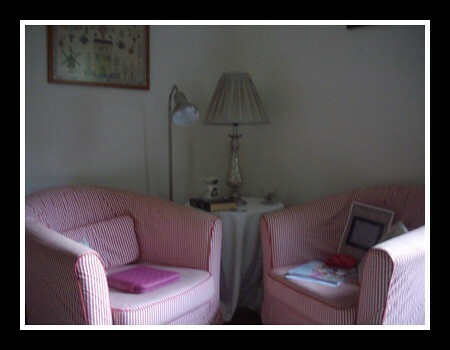 Here I can sit and read, do my needlework, or just think. I have been doing a lot of that lately. The table lamp is sufficient for reading, but I really need the other lamp for when I am stitching. 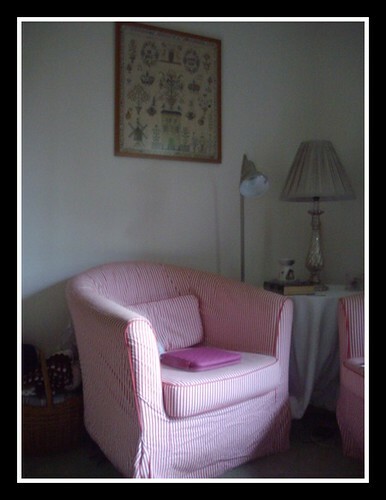 Above one of the chairs is the sampler that I bought while we still lived in The Netherlands. On the other wall (you can not see it right now), is one of the first samplers I ever stitched. It is The Workbasket’s Red House Sampler. Seeing both of these on the wall in here got me thinking. Thinking about the sampler wall I have always wanted to have in my home. And then I started thinking about the different samplers that I could put up here. And I have decided to make my bedroom a homage to the girls who so inspire us, and whose beautiful samplers we often look to reproduce. Where do I start? Finally there is my tall boy, or large chest of drawers. We bought this bedroom suite from Early Settler when we first came back to Australia. 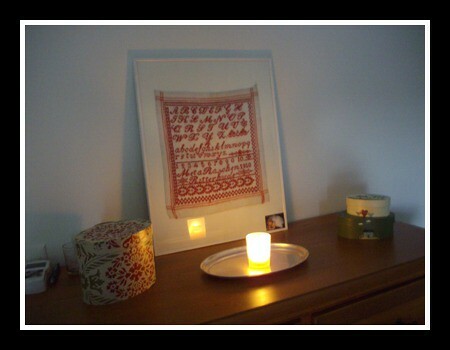 The sampler is an original Dutch Antique Red Sampler that I purchased while we still lived in The Netherlands. The frame is a cheap and nasty one, and I am afraid that the sampler has been incorrectly mounted, but until I can find a conservator, or more importantly, the money to have it properly framed, I am not touching it! The hanging things on the back are broken, so it has to sit on top of the dresser. The 3 oval boxes I also brought back with me from The Netherlands. The two painted boxes I bought in Den Haag, while the third is actually part of a needlework class I took with Tricia Nguyen at A Sampler Gathering more than 10 years ago. I still need to finish that project – oops. This box is covered in vintage or antique wallpaper. The silver tray is from one of my favourite stores – Villa Maison. And the candle is my favourite Yankee Candle – Tea Rose. Next week I will show you the front room – it too is finished – well, almost. I have one picture to hang, and a little clutter to remove. I also still need to steam clean the carpet.